Soon the recent creation of a southbound bus lane will be enforced and force drivers to divert around the ring road. Sheepcote Street is currently a highly congested route especially during the morning rush time but also most of the afternoon from 3:00pm, with slow-moving and long queues. Clearer signage to be implemented this week heralds the enforcement of the bus lane as a no go route for cars. On Monday 26th November the BCC is making some cosmetic changes around the bus lane. The lane is going to be coloured red to clearly indicate it is a no go route for cars. The smaller bus lane signs are going to be replaced with bigger ones and some new signage on the feed from St Vincent Street up to the bus lane will go in. 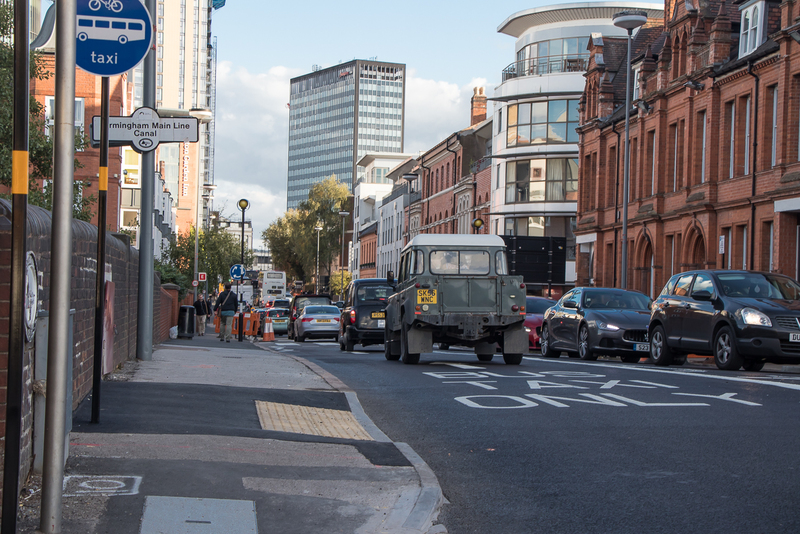 The intention is to create a legal angle so cars who ignore the bus lane (approaching 100%)can be fined. Mobile enforcement should follow when the work is completed but no date has been announced. Unless things change it would seem very wise not to drive along the bus lane to get to Broad Street from St Vincent Street. Furthermore: Eventually Granville Street will become a one-way route away from Broad Street and so use of Sheepcote Street will be severely limited from the South (Broad Street). I understand that the Council wants to rid Birmingham centre of its rat runs through residential areas and promote usage of the Ring Road. My recent observations are that the ring road is a much better option, having more traffic lanes and thus more able to disperse traffic build up with the aid of well timed traffic lights, for example at Five Ways which works very well for the Ring Road. Getting rid of ‘rat-runs’ would be a laudable aim, were other roads not approaching gridlock. As it is, these roads serve as relief-valves for the choked main roads, as drivers desperately seek to avoid long, expensive & disruptive waits in traffic. Buses are dirty & uncomfortable, with poor drivers jerking passengers around. The behaviour of bus users is appalling; queues have been abandoned for a free-for-all. I recently saw a man whose dog vomited at the bus stop, he simply stood back, whilst others, including children, stepped through it. It’s hard to imagine people giving up the comfort & safety of their cars for this. It’s time for major investment in a tube system.